*: Per the terms of the readme file in the DTM pack, you can race, share and modify these vehicles if you include that readme file, or another note stating that Overdrijf is awesome. No other Stunts related creations of mine to date have any such conditions attached, and I'll include a specific note with any future ones that do. That's the article with the link tax. It's meant to secure income for people who's work gets shared a lot, but instead it'll just prevent their work from getting shared. It's going to be a headache for scientific papers, newspaper sites, social platforms and even forums, but I have to agree with Cas that I don't see how it would stop us from uploading any type of track or mod, especially as the game we're making it for was confirmed to now be effectively freeware. I didn't count lap times for SD4000 on Sunrise, but I'll wait for the full analysis to see if it still adds something. It was a good race! That was my motivation to finally get to trying this out, yes. I'll try harder to make it next time. Next live race is then on Sunday 17th, 17:00 Buenos Aires / 18:00 Brasilia / 20:00 London / 21:00 Rome and Budapest. We'll meet on the forum chat at that time. Minor note: when I google it Brasilia appears to be in the -3 bracket with Buenos Aires, that would make it 17:00 Brasilia as well. I'm guessing last time there was some daylight savings time going on. So Sunday 20:00 GMT? Dreadnaut started this thread, would you do the honors of designing the track? EDIT: In case we feel like a round 2, would that be on the same track, or shall I volunteer to make a backup? I have a bit of a regular thing on Saturday evening, but I think I can make that go away. I'd also be able to do Friday or Sunday. I've always assumed that, in ZakStunts, once you've posted a replay, it's not correct to post another that's based on the one you've already posted. That is, I can do all the RH I want, but once the replay is out, I have to start from scratch for the next one. Yet, I have to admit, I've never read that rule anywhere, so I don't know if my assumption is correct. So... is it? And does ZakStunts check for this at all? As I've never done that, I haven't tested it. I don't think so. It never occurred to me to interpret the rules that way. I've done plenty of "I don't have much time, I'll just redo the last part" improvements. 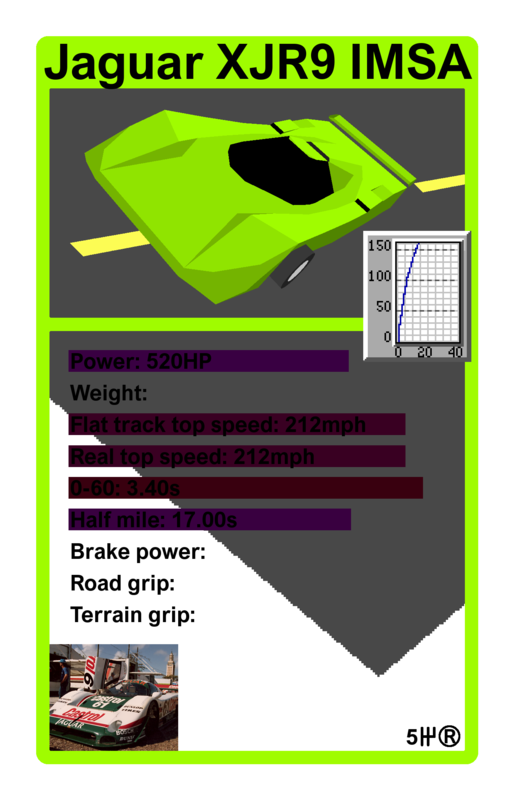 Stunts Related Programs / Re: Car cards! I did some test shopping, this could end up looking kind of cool. See this as mostly a layout and visual content test. For example: I completely forgot again that I was now in favor of car length when it was time to write some example stats. Click here for full detail version, somewhat larger. I thought it might be nice to have a picture of the real life car on there somewhere, not sure how I feel about that now, it kind of clashes with the style of everything else. I also added the ingame acceleration graph. I added number of gears and type of power gear as symbols. For regular, bug-free and anti-power gear cars the symbol is relatively subdued. The symbol should get bigger if the car has power gear, maybe a star shape with a larger letter (or two) in it, and maybe glow or something. I went with a way to be able to base both bar length and bar color on the stats. The lowest stats are blue, the highest stats pretty reddish. Anything that goes over the best or highest original stat becomes even redder and when high enough runs off the card. As you can see I didn't fill in everything yet, I figured this gave a pretty good idea of my concept for this. (I do notice that the black doesn't stand out enough when not super zoomed in. Maybe a different text color? White or something? Black with a white outline is unreadable on a screen but might work in print?) The color of the borders on this one is based on the color of (the primary paint job of) the car. I didn't have a great idea for the filling in of the main text field, but the lone piece of banked road I used in the action picture looked pretty good there, so I left it in for this test version. There might be a good idea connected to it somehow. Speaking of the picture: I composited it of a Stressed shot of the car and that of a banked road. I manually added detail to the banked road because I couldn't take a large enough screenshot. I also touched up the car a bit in those places where the model is a little rough, some white background was shining through the cracks between a few panels, for instance. The main image of the car does not get bigger than this unless A) I lower the quality or B) I use a bigger screen to make the Stressed screenshots or C) I use a different program for taking the pictures. I went with "bridge size" cards, which are the most common kind at least in Europe and the easiest to get printed if someone were ever to take this all the way. It also seemed quite a good format for something that would have a list of stats on it. "Poker size" is a little wider, tarot size is quite a bit bigger overall. For the font I used what I had open from my last project (Arial Nova Bold). I liked how it looked, and I figured someone else would be a bigger font geek than me and know the perfect Stunts font. Those are I think most of my thoughts on this for now. Edit several weeks later: I now think that the stats should be about things like power gear, magic carpets, phazing through objects, stuff like that. If we just do things like top speed they're regular car cards, not Stunts cards. It's going to be a bit of a challenge to find proper ways to quantify these things.